If you've been coming around for awhile, you may be tired of my yearly applesauce posts. If so, I do apologize but it's a pretty big event for us, seeing as we eat applesauce almost every day that we don't have fresh fruit available to us. This past weekend, we traveled north to Jamey's parents' house. 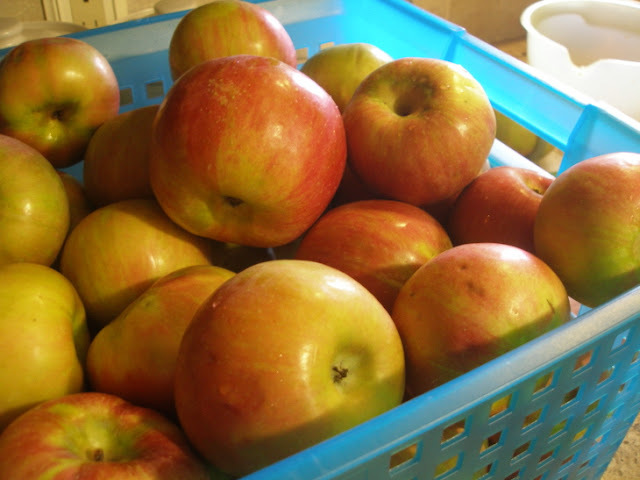 They ordered and picked up the apples for us ahead of time- 18 baskets of Cortlands (~9 bushels). We scrubbed them well Friday night, hoping to ease the amount of work we'd have on Saturday. We got started around 8:00 am Saturday morning. Jamey's mom and I worked in the kitchen where we cut and cooked the apples. Then, the hot pots with soft, fragrant apples were taken out into the garage where Jamey's dad single-handedly worked the squeezo. Jamey was in charge of filling the jars and loading and unloading the 15-quart canner. He did call me out to wipe the rims, lid and ring the jars. Even though he has a lot of experience with canning, he likes me to do this part. We filled every empty quart jar we had left in our house (and smoke house)- 142 of them. We reserved a basket and a half (to bring home to bake with), then filled plastic containers (to be frozen) with the remaining applesauce (another 40 quarts). The whole process on Saturday from start to end of clean-up was about 6 hours. This amazing feat says a lot about my in-laws. They are incredible. Thanks, Mom and Dad! Do you reuse the lids from year to year? 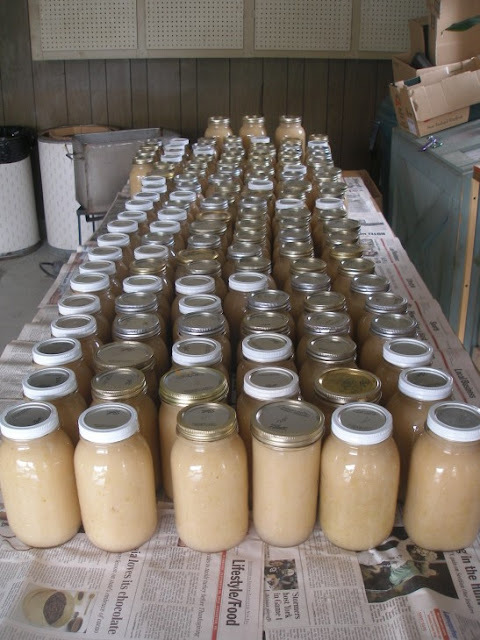 That is alot of yummy applesauce. I am making it today too but wow..
Wow! I am SO IMPRESSED!!! Last Friday I worked up 13 pounds of apples and made 17 half pints of apple butter. You put me to shame HA!!! That applesauce looks delicious!!! Have a blessed day!! I'm newer to your blog, but loving every post! Can you tell me what your "squeezo" is? and what are you using to can that's hooked up to the propane tank? Where can you get that? Thanks!!!!!! Welcome, Schneider 4.0! Search for "squeezo" on Amazon.com and you'll see all the brands and choices out there. They range from $35 to $200. We use and love the cheapo version- it works just fine. 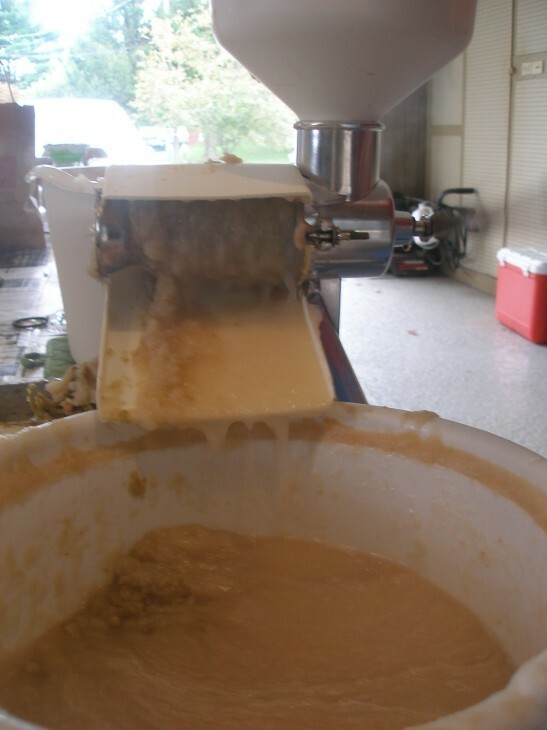 How you use it- you place soft, cooked apples in the hopper at the top, then turn the handle and use the plunger to help the apples work their way through the mesh strainer (which is covered in applesauce in the picture above). The sauce then can be scraped off the mesh (it also just falls off) down the chute and into your waiting pan or bowl. 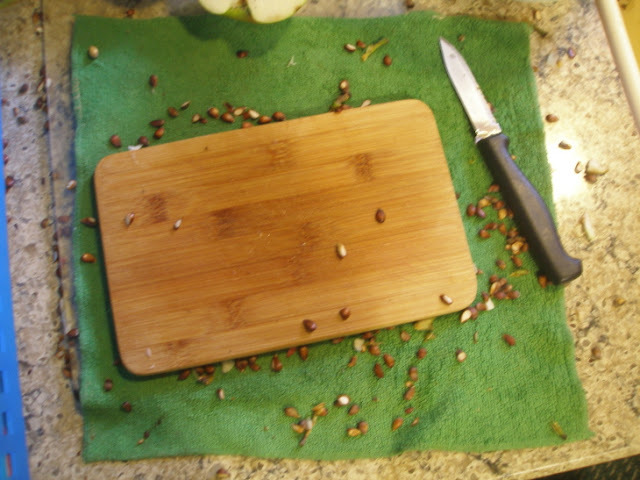 The seeds and skins come out the side where they can be collected into another bowl to be discarded. 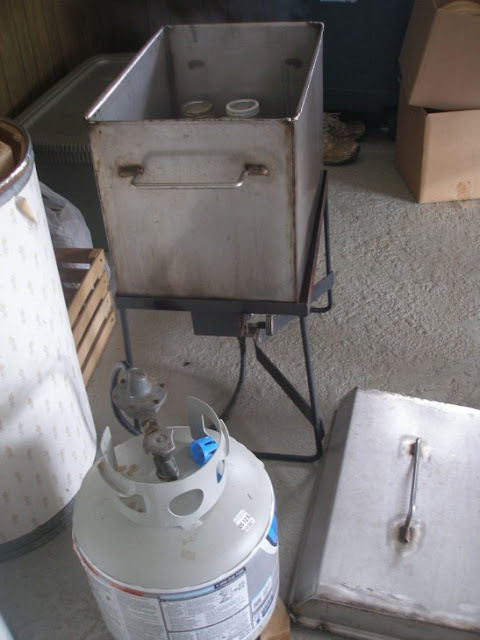 The canner is custom made. 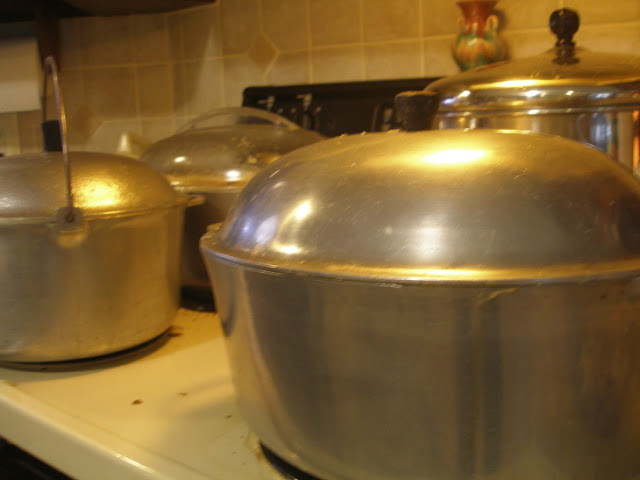 My in-laws bought the large canner which can be found online or catalog companies. They had a welder make the stand for them and rigged up the propane tank. It's really wonderful since you can do all the canning outside, freeing up your stove top burners for cooking down the apples:-). Thank you! You are a wealth of knowledge!!!!! I know a welder and Christmas is coming...this may be a perfect gift! HA! That is INSANE. And please, realize that I am speaking out of PURE, UNADULTERATED JEALOUSY! I am canning applesauce slowly, bit by bit - seven quarts at a time. One day, six hours........sounds like a dream :) And just a by the way........we did pears this year, just 60 quarts from a friend's tree and didn't peel them! Worked with the nectarines, figured we would try it with the pears........they taste fabulous! We will see how they hold up. Wow! That is a huge amount of applesauce to put up. I've never seen a canner like the one you pictured. I'm assuming that the rectangular thing is a canner. I was also wondering about putting two different sized containers in the canner (it appears there are a couple of jars in the canner that are larger than the others). Doesn't the processing time differ depending on the size of the container? We don't really eat applesauce here - at least we haven't since the kiddos were really little. I bought a couple of bags of apples the other day and am getting ready to do some apple butter in the crock pot. I've tried making it on the stove before and it didn't turn out quit right. 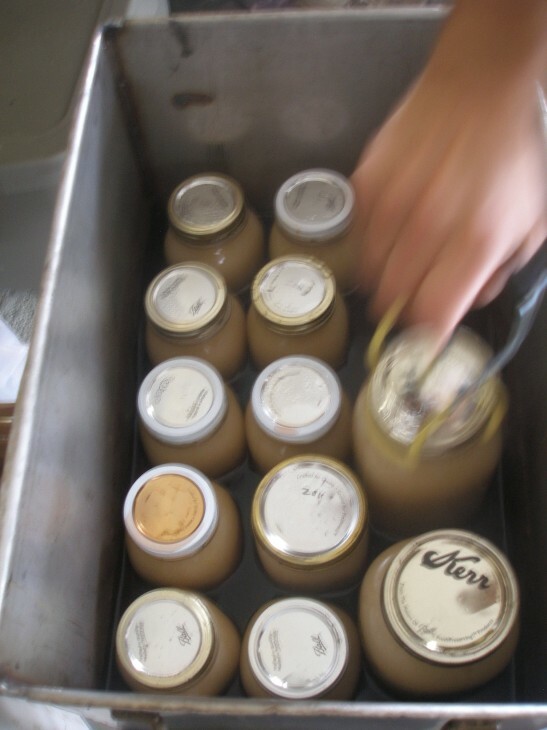 A couple of times we purchased a quart or two from an Amish lady. She makes the absolute best apple butter I have ever tasted, but lives so far away that it is not economical to travel that far with gas over $3/gallon and then pay almost $5 per quart for the apple butter. So, I'm going to try again with a different recipe and see if it tastes better and has a better texture. Do you ever make apple butter? If so I would love to see your recipe if you would be willing to share it. 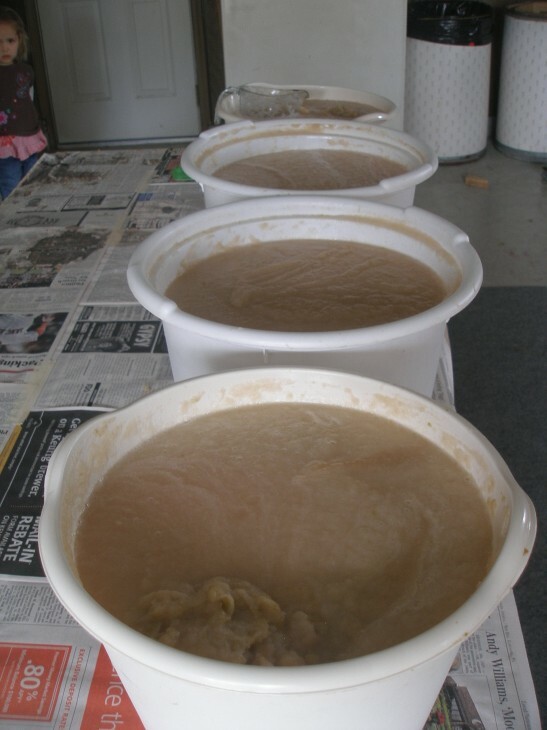 Wow, that is a lot of applesauce. My hands aches just looking at the amount you had to peel. But I know it's awesome throughout the year opening our own jars of canning. Thankfully, the squeezo takes care of the peels, so we only had to quarter the apples and remove any bad spots. Even so, my hands were tired by the end of the day:-). This blows my mind every year! I am so impressed. I should think about making some for Jerry with no sugar or other non-essential ing, his oncologist P.A. or what ever they are called, messed with Jerry routine of cardiac management ,now he is on a very low sodium and low fluid restriction (only 32 oz. per day ) ,but has already taken off 15 lbs of water wt. he put on,not good,the loss is good,I even found a place to sell me free range chickens.There is nothing good in a reg grocery store. I am so impressed! I don't know how you do it!